Multichannel routers, or MCR's, contain multiple different modems such as 4G, 3G cellular, CDMA450, TETRA-modems etc. The DSiP software in the routers create multiple secure parallel data-communication links using all the modems (channels) in the units. The multiple DSiP connections will appear as a single, ultra-robust data channel towards external equipment and software connected to the multichannel routers. Link-establishment and communication is constantly maintained by the DSiP software; Should one communication channel fail, other channels will seamlessly continue working. External satellite modems may be used with the multichannel routers. 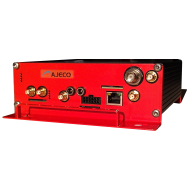 An efficient and versatile Intel Atom™ based design with 5 pcs of Ethernet-ports, USB-ports and flexibely configurable modem options. 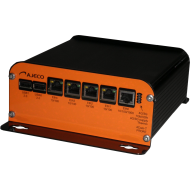 A cost-efficient ARM9-based design with 2 pcs Ethernet-ports, USB- and serial ports. Internal TETRA-options and many interesting features.